However Improbable: "Age of the geek, baby." "Age of the geek, baby." Have you ever had one of those days where you can get your jacket on because the sleeves won't go over both arms? Or where you are eating and somehow the fork keeps missing your mouth? I think it should be law that on days like those we should be allowed to stay in bed and read a book. The DeLallo's decided that when I came out they were going to show me the TV series called Leverage. They determined to get me through all five seasons of it. (Impossible, you say? You don't know us.) I'd only heard about the show from them, it didn't sound like one I would pick to watch on my own, but they all highly recommended it, and we shared a lot of the same likes in shows and movies so I trusted them. Leverage is about a team of highly skilled thieves. Their mastermind is Nate Ford, a man who used to be an insurance investigator later...well, turned thief. He's like a modern day Robin Hood - robs from the wealthy and gives to the poor. Now, the what I liked about this show. Second, the characters. Nate and Sophie were okay, but not my favourites. They become kind of like the parents as the show goes on, which is a lot of fun. But they just weren't my top favourites. Mine were an equal tie between Hardison and Parker with Eliot close behind. Hardison is a geek. He quotes Star Trek and Doctor Who. He's cool. He's also a gentleman and very sweet. And everything past this point has a risk of being filled with spoilers. I don't intend for there to be bad ones, but it sounds like everyone else in the world has seen this show and I am the last. So I am going to put some in. And I especially liked it when Hardison had to work with Eliot. They were funny together, complete opposites, and acted like brothers. (I think Hardison would have been the younger brother, doing everything he could to purposely annoy his older brother.) My favourites though were the moments Hardison got Eliot to have fun, like when they were chasing down bad guys and singing, and then Eliot would realize what he was doing and throw Hardison a look which seemed to say, "How dare you make me enjoy myself!" 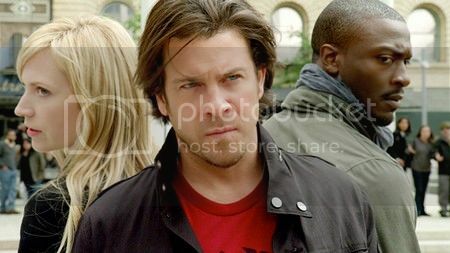 And speaking of Eliot, I LOVED how he was with Hardison but especially Parker. He looked after her, and sometimes let her annoy him just because. (Such as when was wounded and she sat beside him and kept poking him.) There was another time as well, I can't remember what had happened, but Parker was upset over something. (From what I remember, some guy had done something to her, but for some reason I don't remember what was going on.) Anyways, she wanted to kill the guy and Eliot said he could do that for her. Because we all need big brothers who strangle people who aren't nice to us. She is a really fun character and I liked her a lot. Hehe! I can hear Hardison saying that line as well as the line Nate says at the opening of the show. I haven't seen all five seasons yet, but I do love the show and have been watching it on reruns (with my few regular channels since we don't have cable). I think Parker is my favorite character, although it's really close between her, Hardison, and Eliot. I love it when Hardison says that line. YOu just made me want to watch all five seasons again! It's an awesome show - although, like you, I enjoyed Parker, Hardison, and Elliot the most for all those same reasons. I hope there's a spinoff!!! Oh, and I get the need to curl up with a good book on day like that . . . hope your day looks brighter soon! This is one of my favorite TV shows! I'm with you like Parker, Elliot, and Hardison the best. The way they work together (or don't work together sometimes). But I think I like Elliot more than Hardison. We recently watched the episode where they are all telling how they stole a vase from a museum before they met. The best part was how each story changed and Sophie's accent kept getting worse and worse (I like Parker's version the best). And the one where Hardison and Elliot are running from a rebel militia encampment instead of fishing like Elliot had planned. Leverage sounds like a good show! And it makes me think even more how much you'd enjoy StarGate... From what you said here, it sounds like the two shows would have the same "feel." Lighter, not traumatic, with epic characters, and a nice, geekish guy or two. Plus, StarGate has the added advantage of being sci-fi mixed with archaeology. I didn't know you liked Parker and Hardison more than Eliot! The one where Parker wants to kill the guy and Eliot says he would was the one with the fake Psychic who made her cry. Why was I the only one getting a dirty look at the "I know which moment" part!? Everyone kept the secret, and not just meeee. lol. And now I shall recede back into my boringness. TWO GOOD OLD BOYS! BEHIND THE WHEEEEEL! CHASING DOWN BAD GUYYYS IN LUCIIIIIILLE! I really love this show, too. When I started watching it, I binge-watched the first three seasons in a weekend. I think Elliot is my favorite character, but Parker and Hardison are close behind. I really like the way they did Hardison and Parker's relationship too - hardly any romance, but *way* more believable than the vast majority of TV couples. I sometimes think that I need someone to congratulate me, if I have gotten through a bit of socialising without stabbing anyone with a fork. I just finished watching the entire series a few months ago. I am so happy that I chose to watch it. The show is always good for a laugh which is perfect at the end of a long day. I love the dynamics between Eliot and Hardison and Parker too. They left it wide open at the end to continue with the show if they wanted to. I really do hope they come out with a spin off show in the future. I'm having to sit on my hands to not quote every single thing you said because YES. You put ALL my feelings of this show into words. I agree with EVERYTHING!!! I love how this show is light and happy. My other favorite shows are Doctor Who, Sherlock, and Merlin, and those put me through such mental anguish. But this one makes you happy, and gives you GOOD feels. It's so refreshing to have a show like that. AND THE CHARACTERS. Some of my favoritest group of characters ever. Parker is my ALL TIME fave, but Hardison is a veeerrrryyy close second, and I adore the other three as well. I just love them all! And, as you said, their different relationships are just perfect. I love how Nate and Sophie are the parents and the other three are basically the children. Ah, it's so funny. Okay, I'm done spazzing now. Sorry, I just get reeeallly excited when someone mentions this show. I don't know many people who watch it, so I kind of get starved to geek out with it with someone. Becca and I have heard lots about this show, but when we watched the first episode, we were scared off a bit... But we've been told it gets better, so we might give it another shot. I am so glad you liked Leverage. Its one of my favorite shows because everything about it is just so FUN! There are some sad bits and some tense bits but over all its just light and funny and a comfort show. I loved how the team became more of a family by the time the show was over. A dysfunctional family. Elliot, Parker and Hardison are my favorites too. I think they're all our favorites. Nate and Sophie are good too but those three are the best. PARKER AND HARDISON!!!! THEY ARE SO CUTE! I LOVE THEM! My favorite show - clever - "Mission Impossible" like - without the perfect characters. I'm a Sophie fan.